Under the English Common Law, children were treated as property of the father. In the event of divorce, the father would have custody of the children. In the 20th century, the “tender years” doctrine became the accepted theory in custody matters. Under the “tender years” doctrine, young children were placed in the custody of their mothers unless the mother was deemed unfit. Unfitness of a mother to have custody of the children could be related to drug abuse, alcohol abuse, neglect of the children, abuse of the children, bad morals, mental instability and other reasons making her unfit. 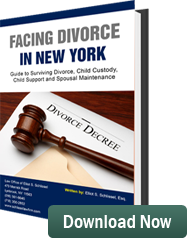 The most recent models concerning custody deal with child’s “best interests.” Under this theory the primary caregiver to the children during the course of a marriage or relationship is the parent who should receive custody. Fathers’ began to organize because they felt they were being unfairly treated with regard to issues concerning custody of their children. Fathers felt they were being discriminated against and had a disadvantageous position with regard to custody issues. Fathers sought to create an environment in the Family Court where their equal rights to have custody of their children were actually enforced. If you are a father involved in a custody dispute, you want the most experienced, dedicated attorney representing you. If you are a caring loving parent, deserving of custody you should be awarded custody. The fathers’ rights lawyers at the Law Offices of Schlissel DeCorpo have more than thirty-five (35) years of experience taking legal action on behalf of fathers to obtain custody and visitation with their children. Call for a free consultation.